The key to this nearly day-long talk time (people with insomnia will probably appreciate it) the giant battery that Motorola somehow managed to cram inside. We are talking a capacity of 3300mAh here. That’s almost the size of a 7″ tablet battery. Big (in capacity) batteries are usually big (in physical size), but we put the MAXX next to one of the thinnest smartphones ever, its RAZR XT912 half-twin, and saw only minor physical changes. At a micron under 9mm the Motorola RAZR MAXX isn’t the thinnest phone around, but it’s still slimmer than an iPhone 4S and its battery has more than twice the capacity. The MAXX weighs more than a regular RAZR (145g vs. 127g) but it’s not overweight by any means. Everything else about the Motorola RAZR MAXX is virtually identical to the regular RAZR for Verizon – that means 4.3″ qHD SuperAMOLED screen with scratch resistant glass, 1.2GHz dual-core CPU, 1GB of RAM and LTE connectivity. We’re happy to report that the Kevlar-coated back is still onboard too. 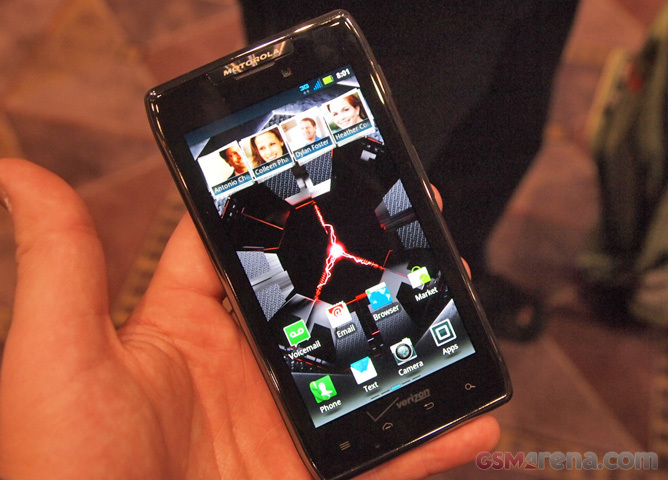 The Motorola RAZR MAXX will be available soon for $299 on a two-year contract with Verizon and it will come with 32GB storage (16GB built-in + 16GB microSD). It will launch with Android 2.3.5 but 4.0 Ice Cream Sandwich will be made available later on. The third phone of the Verizon Droid roster is the purple version of the Motorola RAZR XT912, which will be available soon for $199 with a two-year contract with Verizon. The purple is more of a highlight – the glass bezel all around the screen is still black, it’s just the plastic around the edge that’s purple. On the back, the grey/black Kevlar surface dominates and the glass that houses the camera, flash and loudspeaker is black too. We suppose Motorola couldn’t have painted the Kevlar, but it would have been nice if they colored the black glass at least. Specs-wise there are no differences between the purple and black models of the Motorola RAZR for Verizon.